This review is a little different to our others. 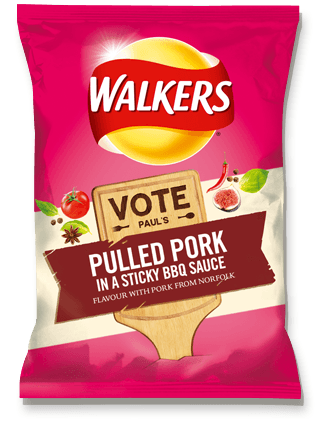 Walkers annual million pound contest features flavours that will almost certainly disappear as quickly as they appeared – unless they stumble across that incredible recipe that their lab full of Crisps chemicals engineering geniuses had not already considered. As it is little more than a marketing exercise (which, as it makes the winning contestant very rich indeed, should be applauded), we have put our taste testers to work with a different agenda. Rather than just test the taste and Crisp properties as we do with our other reviews, we will compare. As our testers have tried over 1,300 different Chips & Crisps from around the world, whoever judges the actual contest will almost certainly have far less experience, so if you’re looking for the REAL winner of this challenge, it is to this Chips & Crisps page you should refer! 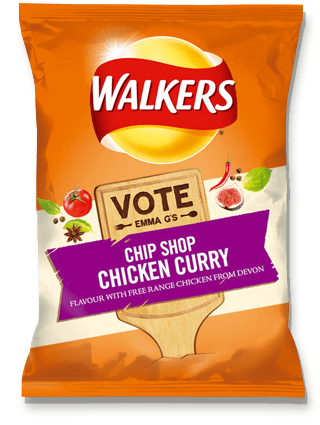 The North of England may be more familiar with this flavour than those in the South, where Chip Ship Curry is not seen as regularly on the menu boards. However, this flavour will be familiar to all Brits that have tried Chinese Curry sauce. As for how near the flavour represented the taste it was trying to achieve... Well, 'exactly', would be the phrase we would use. Slightly sweet, a hint of not-at-all-hot Curry, a touch of spice. Hold the front page: But what’s this? The flavour is actually Chip Shop CHICKEN Curry. You see, Walkers provided an ingredient that required inclusion for this contest. And the point here is Chicken, Beef, Lamb; it doesn’t really matter to the original recipe of this style of Curry sauce. So, although an accurate representation of the flavour it was attempting to achieve, it just has to lose a star because there is absolutely no hint of Chicken in the flavour. Another familiar flavour to American Potato Chips and Crisps eaters. This could be a clue for future contest entries – if Lays (Walkers parent company) have made something similar in the US, add a UK twist and ta-da. Anyway, there was undoubtedly a smoky flavouring and the Barbecue Sauce mixed well. It took a few, but enough Crisps eaten and the Ham flavour shines through. We would have preferred a little spice but the sweetness was probably more appropriate for a flavour - that if not such a descriptive mouthful, could really hit the mainstream. What a weird flavour this was. Firstly, it should be said that there was unsurprisingly no distinguishable reference to Aberdeen Angus Beef within the flavour at all. That shock over; what of the taste? Well, there was actually something Fajita like in the flavouring, but sadly, not necessarily the best aspect of it. Fajitas have Onions, they have Peppers and they have spicy Mexican sauces. They also have a charred barbecued beef taste, invariably from a ‘Sizzling’ hot plate or pan - Which is the flavour that shone most prominently. Sadly, it is unlikely that ‘Burned Beef Flavour’ would work as a regular on the Crisps aisles. I am not entirely sure it really matters where the Cheddar comes from when melting it over Baked Beans. 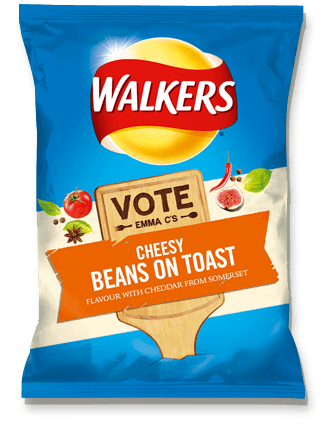 Sadly, our entry of Cheese & Beans on Toast with Worcester Sauce was rejected so we were more than looking forward to see what these tasted like. There was certainly something Cheesy about them, and while it may well have been focussed imagery, there seemed to be an underlying resemblance to Toast somewhere in there. I can’t say for sure whether there was any Baked Beans flavouring about, but there was an ever so slightly sweet tomato taste in the background. Overall, the emphasis was a bit wrong and the flavour was fairly weak. Given the option of this or a plain Cheese Crisp, the latter would surely be preferred by all. With Marco Pierre White accompanied by David Walliams on the judging panel you just knew the comedian would sneak in a joke flavour. But was it a joke flavour? A Nose Plunge Test revealed the sort of smell you would expect when opening a can of Double Cream. The flavour was all a bit milky cream and parsley. Or, a very familiar 'Sour Cream' which can be found on Potato Chips shelves all across America. 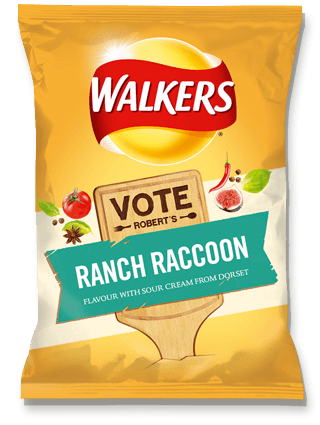 I would not presume to suggest what Raccoon tastes like, but you can be assured there was nothing remotely Raccoon like in these Crisps. Which of course undermines the claim on the bag. These were just Sour Cream Crisps without the usual Onion accompaniment. A Nose Plunge Test was a must for these. Would they conjure up imagery of a New York winter’s day? What about the frying onion smell of a seaside burger van? Well, no. It was more a muted Tomato aroma. So, what about the taste? At first the flavour that came through was a meaty, maybe even smoky, sort of Tomato. There also seemed to be a bit of a herby addition that was something like Coriander. The after-taste was most certainly smoky, but also Hot Dog, and maybe even a bit of bun. There was no Sauerkraut or Onions and no Mustard, which was a shame because it takes all that to make a great Hot Dog. However, we were in search of a flavour resembling what it said on the bag, and although there was a fairly representative taste, it was not nearly as rounded as actually eating Hot Dog with Ketchup. It’s not just about the marks, the Cheesy Beans on Toast were completely lacking in originality, as was the Ranch Raccoon, which was just like any Sour Cream Crisp, except missing the usual accompaniment of Onion – or flavour, as some might suggest. And the Hot Dog with Tomato Ketchup took a regular flavour (Ketchup), and made it not as nice. 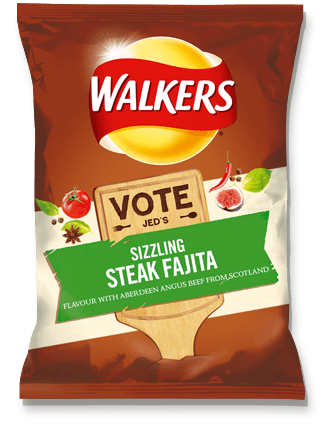 The Fajita flavour also lacked something it could have easily featured – spice. Although it brings originality to the party, it is also a very British flavour. It is actually quite surprising that this is not already a regular flavour in the Crisp aisles of UK supermarkets.